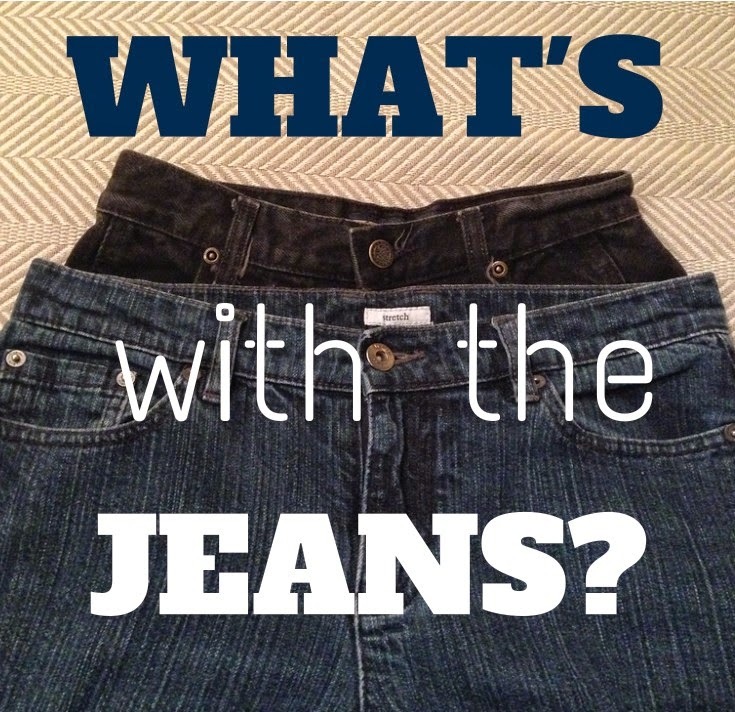 What would you say these two pairs of jeans have in common? - They're both made of denim. - They both have a zipper and rivets. - They're the same size. Yes, you just read that right. These two pairs of jeans are the same size! At least, that's what the tag says. Besides the size of the waist, I'd say at least 10 years! The blue pair on top are the infamous jeans mentioned in past posts; the ones I can now put on (yay!) but still can't move in (boo!). The black pair on the bottom came from my sister. She recently discovered them while I was helping her clean out her closet. My sister actually had three pairs of jeans to get rid of that were my size. Even though they were dated, I gladly brought them home. I don't mind wearing old "mom" jeans around the house, especially now that I'm caring for Dude & Bubba several days a week. Playing with toddlers is tough on the knees (both for me and the jeans!) Unfortunately, only one of the three pairs fit even though they all said they were the same size. Looking back, I think that's probably when they started changing the sizing to make us feel better. That would explain why I can weigh 20 pounds more than I did in high school and yet wear a size smaller than I did back then. I've known for a while now that the more money you spend, the smaller size you wear, but this explains why there is a size 0 now when there was never a need for one before. Naming names is not popular in today's society because we don't want to offend anyone. I wasn't going to do it myself until God pointed out my hypocrisy. I've heard that Rob Bell is a very nice guy, he's a prolific writer and charismatic speaker, but by questioning the reality (according to Scripture) of eternal punishment (hell) he may make us feel better, but he's not doing us any favors. People are no longer content to have the freedom to sin; now they're looking for affirmation for their sin and if you don't give it, you're branded "intolerant." God calls us to speak the truth in love because speaking the truth is the loving thing to do. Speaking what people want to hear is the popular thing to do. 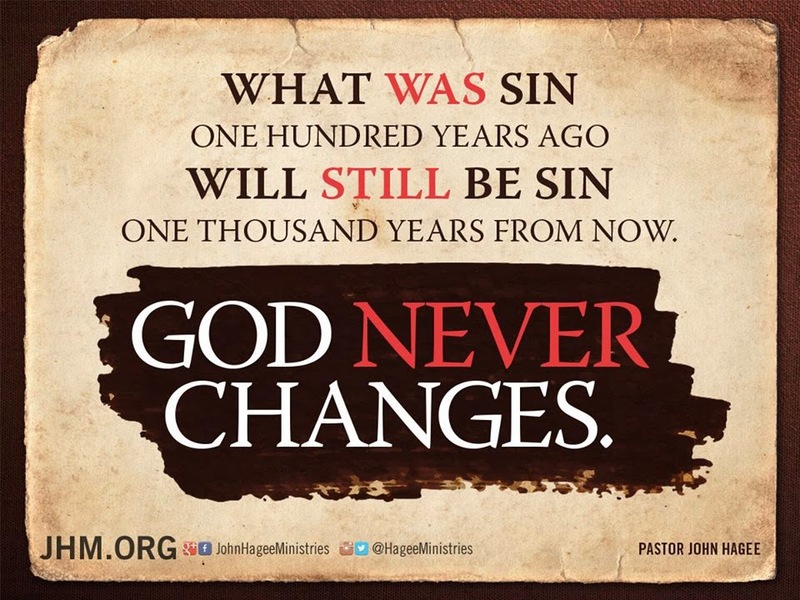 You may be tempted to please people by saying sin is not sin or affirming that there is no eternal punishment, but that doesn't change the reality of both. And honestly, I don't think people engaging in sin would be satisfied even if we told them what they wanted to hear. Why? Because they were created by God and His law is imprinted on their hearts. Even if they're not feeling convicted by us, they're still going to feel convicted because deep down they know right from wrong, they just don't want to acknowledge it. Father, we have all sinned and fallen short of your holy standards which is why I'm so thankful that Jesus paid the penalty for my sin and I'm forgiven. Please give me the courage to say not what is popular, but what is true. Help me to be more concerned with what you think of me than what anyone else thinks of me and enable me to point others to your truth so that they too may come to know your love and forgiveness. This is an interesting post to read. Thumbs up. Lisa, I love this post and thank God you wrote it. I have felt so lonely on this topic and shocked at the way Christians kowtow to the popular world view. In the Bible Paul names names so I take that as teaching that we should to. We need to speak truth in love not follow the world! Caryl Matrisciana is a great truth seeker - you might enjoy her work. Hi Lisa, I am so loving this post. I will never understand why the fashion industry does this! I guess if we all say something long enough, maybe it will become true??? LOL - NOT! We do need to speak the truth in love, otherwise this world is just going to become darker without our light. Tell it like the Bible says it is! Wow!! Thank you for sharing your awesome post with us here at 'Tell Me a Story." Oh yes I understand about those jeans! Hey Lisa ... I'm stopping in to say hi from Beth's place this morning. I'm your next door neighbor and I love this jeans story. It's good to meet you here in this place! Enjoy this gorgeous spring day! Yes, Paul named names and I agree that we should also but at the same time we must know scripture to explain why what these false teachers are teaching is false. Sometimes I think people want to name names but don't back up their findings with scripture as to why what this person is saying is not correct. So much yes! Unfortunately, this seems to be a trend in new and emergent churches. Preach to the unchurched, but don't become the unchurched. Jesus ate with sinners but didn't become one. We are so anxious to make people feel included and loved and accepted that we are essentially damning them by never letting the experience the grace and truth of the gospel. I've been talking to a close friend about this a lot lately. Great post. I think I missed this post when you linked up for TWW. I try so hard to get to all of them but there are weeks I must admit it isn't possible. Glad Laura shared a link in her post. :) Much of this jumped out at me as we just finished up a series at our church on having a Biblical worldview and we also talked about false prophets. Thank you for sharing. One thing you made me smile about is the fact of my jeans. A number of years ago... nearly 40 years when I was 28 ... I was extremely thin [about 114 pounds] and had a size 9 or 10. NOW, having lost weight after a surgery 2-1/2 years ago, I dropped from 182 to 147. And NOW? I have size 10 jeans. It's a truthful reality issue when put in place by the way our "cultural" decisions are made. Amazing how our world changes to make people "happy" and reality strikes again. Thanks for sharing. This speaks to me. I have this problem all the time. People come to me all the time for advice. I use tact, but I don't candy coat. I speak the truth and a lot of them don't like what they've heard and I get ridiculed for a while. But, they keep coming back for more and tell me they love my honesty. Gets me a little emotional sometimes. Enjoyed your post. We do always need to speak truth in love, even when it is not popular or easy. Stopping by from Thrive at Home Thursday. I was once told by a perky sales gal no older than 19..."How do I put this gently? People are getting bigger." Then, she bragged about being a size 0. I love what you said about people wanting affirmation for their sin and if you don't give it they call it intolerance. Great line! Great analogy - I was thankful to hear my pastor preach a sermon a few months ago where he named several names of those who are not using scripture correctly....and Rob Bell was one of them. I appreciated, so much, his courage to name names, as I agree with you....it is confusing to just wonder. Thank you for posting. Thanks for sharing this post. I liked the shift from the thoughts on jeans to scripture.